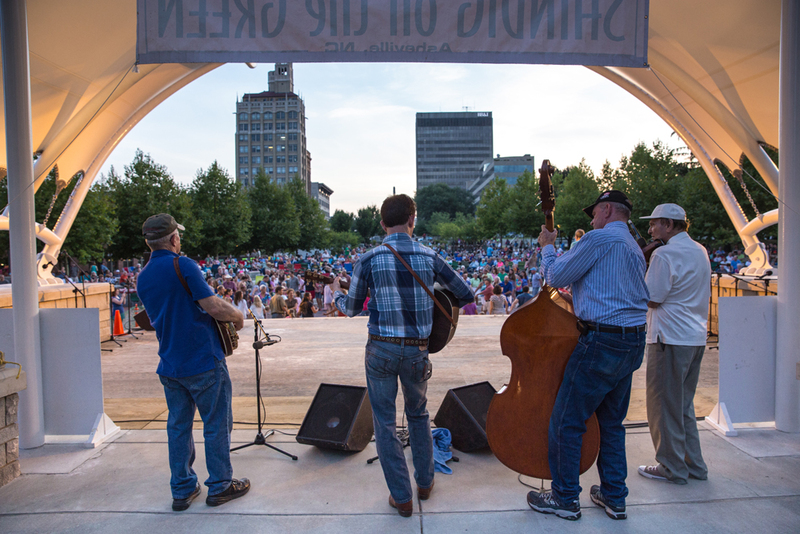 The Folk Heritage Committee announces its summer 2015 dates for two celebrated mountain traditions in Asheville, North Carolina: the 49th season of Shindig on the Green and the 88th Annual Mountain Dance and Folk Festival. Each event features long-standing as well as the newest generation of traditional and mountain string bands, ballad singers, and big circle mountain dancers and cloggers, resulting in fun-filled and authentic evenings enjoyed by kith and kin of all ages. The 49th Season of Shindig on the Green, a free event in the heart of downtown Asheville, with a stage show and informal jam sessions, takes place on Saturday evenings. Kicking off on June 27th this year, Shindig on the Green will be held on June 27; July 11, 18, 25; August 15, 22, 29; and September 5. Shindig returns again to the heart of downtown Asheville at Pack Square Park’s Roger McGuire Green. The stage show takes place on the Bascom Lamar Lunsford stage, named for the founder of the Mountain Dance and Folk Festival. Locals and visitors alike gather “along about sundown,” or at seven o’clock for those who wear a watch, for Shindig on the Green. Since the outdoor event’s inception in 1967, hundreds of thousands of individuals from across the region and throughout the world have shared and enjoyed the rich traditional music and dance heritage of the Southern Appalachian Mountains in this outdoor setting. The 88th Annual Mountain Dance and Folk and Festival, a ticketed event at Diana Wortham Theatre in downtown Asheville with a different show each night, takes place at 7:00 p.m. nightly, Thursday through Saturday, August 6, 7 & 8, 2015. The sister event to Shindig on the Green, the Mountain Dance and Folk Festival was founded by Bascom Lamar Lunsford in 1928. The nation’s longest running folk festival, the Mountain Dance and Folk Festival showcases the best of the region’s mountain musicians and dancers during its three evenings of indoor performances. Loretta’s Big Hug Super Saturdays: On Saturday, June 27th, Shindig on the Green will be the beneficiary of Loretta’s Café’s Big Hug Super Saturday. Loretta’s will donate 10% of all sales on June 27th from 11:00 a.m. to 5:00 p.m. to the Folk Heritage Comittee. More information at www.lorettascafe.com/events.html. For more info about the 49th Season of Shindig on the Green or the 88th Annual Mountain Dance and Folk Festival, visit www.folkheritage.org or call the Folk Heritage Info Line: 828-258-6101 x345.